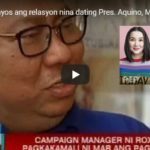 Why is Fariñas now Quiet in the Imee Marcos, Ilocos 6 Probe? Rep. Rodolfo Fariñas shuts up his mouth after he was declared persona non grata in his own hometown. However, there are rumors that House Committee Chair, Johnny Pimentel tells Fariñas to inhibit from Imee Marcos and Ilocos 6 probe. The people can feel that there is power struggle happening in the 3 branches of government behind the scenes. But the worst thing is obvious. There is conflict even within the Congress itself. 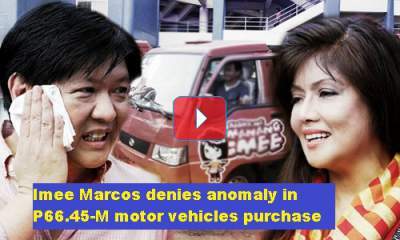 [VIDEO]: The House wants Ilocos Norte Governor Imee Marcos to personally explain why the provincial Capitol used P66.45 million in tobacco funds to purchase motor vehicles. Ilocos Norte Gov. Imee Marcos denies the alleged irregular purchase of P66.45-million motor vehicles in her province using tobacco excise tax shares. Rep. Fariñas initiated this controversial Congressional inquiry. In the subpoena, she is ordered to appear in the Congress on July 25 probe to shed light on the issue. Fariñas owes his political glory to the Marcoses who was once a long-time ally of the popular Marcos clan in Ilocos Norte. His move is considered by most Filipinos as political in nature. This can be the reason by Pimentel wants him to inhibit from the case. Nex battle is between Pimentel and Bongbong Marcos whom he threatens to hold in contempt for alleged obstruction of justice. According to ABS party-list Rep. Eugene de Vera, the provincial government purchased 40 mini-cabs, five buses and 70 Foton mini-trucks from 2011 to 2012 without conducting proper public bidding. He added that the Land Transportation Office also said that none of the vehicles in question are registered under the provincial government. Gov. Marcos, the late President Ferdinand Marcos Sr.’s daughter insists that the vehicles in question are existing and not overpriced. The registration can follow if required. They exist because of the farmers’ request. Nevertheless, Marcos welcomed the House inquiry. She notes that it would be an opportunity to amend Republic Act 7171. The law aims to promote the development of farmers in Virginia-type tobacco producing provinces. 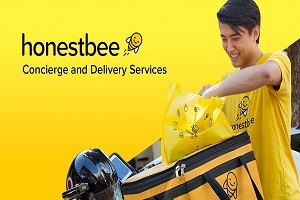 She is positive that it will give her the chance to clear up some issues regarding the transactions. Although, it is not clear yet if she will give in to the House of Representatives’ subpoena or negotiate a venue in Ilocos Norte for some talks. The Congress or House of Representatives gets its bad reputation nowadays because of some lawmakers’ partiality or unfair treatments particularly with the Ilocos 6. Remember that the House is not just the office of House Speaker Pantaleon Alvarez, Rep. Johnny Pimentel, and Rodolfo Fariñas. Former First Lady Imelda Marcos and Former President Gloria-Macapagal-Arroyo are Congresswomen as well. This is why Bongbong Marcos advised her sister to bring the matter locally. 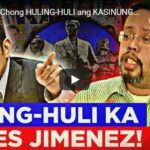 [VIDEO]: Bagamat wala pang iniisyu na warrant of arest laban kay Ilocos Governor Imee Marcos ay ipinasisilip na ng Kamara ang detention chamber para sa Gobernadora sakaling bigo itong dumalo sa July 25 hearing kaugnay sa isyu ng maling paggamit ng pondo ng probinsiya. Governor Imee Marcos’s refusal to attend the tobacco anomaly probe on July 25 has nothing do with her guilt. Her explanation through a press conference says it all. She is indeed the voice of the people. Her ways are for the welfare of her constituents, unlike her rival Fariñas’ politicking. It is scary to think that the people have this negative perception about the House of Representatives when there are only a few in power that commit such power abuses. “We will be following the proper procedure. What is Gov. Imee afraid of? We will not detain her. The detention room showed to the media is just hypothetical in nature,” Pimentel said. He clarified that the House’s detention rooms were only shown at the request of the media. The governor just recently announced that she invited the House Committee to conduct talks about the alleged tobacco excise tax anomaly in Ilocos Norte as suggested by Bongbong Marcos. If they insist on their unconstitutional method, then Marcos has no choice but to defend herself and her constituents’ rights as lawful as possible. It is a mockery for the Congress to prepare the Internet-equipped detention room of the elected Governor Imee Marcos for her to continue her work online. The question is not in her ability to work away from her official office but in their undemocratic approaches when there are other legal remedies available under the constitution. 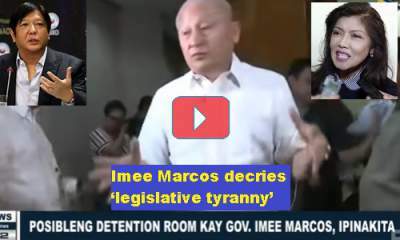 [VIDEO]: Imee Marcos would still be able to work as chief executive of Ilocos should the House of Representatives order her arrested for failure to attend a hearing on her alleged misuse of tobacco funds. House good government and public accountability committee chairman, Rep. Johnny Pimentel took reporters on a tour of Marcos’s “hypothetical” detention room at the extension office of Sergeant-at-Arms Roland Detabali at the third floor. It is fronting the rooftop of the main building’s South Wing. Asked if Marcos could still do her job if she was ordered detained on a contempt citation, Pimentel said: “Probably, she can.” “There’s Wi-Fi, there’s the Internet; she’s also allowed to bring her cell phone. Actually, our rules are very liberal,” Pimentel. Yes, Liberal Party ways indeed. The press tour in Marcos’ detention room is ready even before the arrest warrant. This is a purely to intimidate Marcos if not mental torture. No citizen or leader for that matter should go through the ordeal under the democratic constitution. 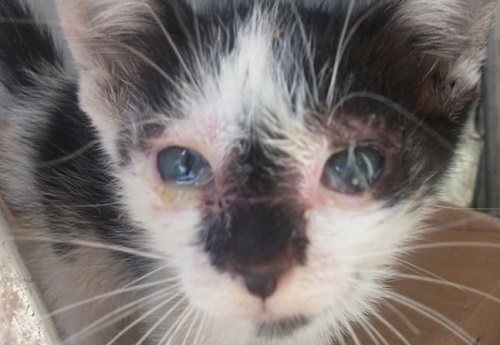 It is really clear that these lawmakers are sadistic in nature. They are not fit to create laws for the welfare of the people. There are also the “hypothetical” detention rooms for the three justices of the Court of Appeals Special Fourth Division. They ordered the release of the so-called Ilocos Six provincial officers. The Congress cited them in contempt because of their unsatisfactory answers from May 29 until at present. The Supreme Court still has the right to intervene with the abuses of their co-equal branch. But the House headed by Pimentel and Alvarez just want to deprive them of their freedom against all odds. This question looms over Facebook after the Martial Law’s 11-3-1 Supreme Court Ruling; Is it applicable to Bongbong Marcos’s Electoral Protest? There’s actually a great possibility since it was the SC that approves the Hero’s burial of the late President Ferdinand Marcos. The Chief Justice seems to be democratic as well on Gov. Imee Marcos’ Ilocos 6 case. Governor Imee Marcos is under grieve intimidation by the Congress on the alleged misuse of the tobacco excise funds. Her detention room, in fact, runs on a high-publicity media campaign. This pushes her to retaliate in saying that she is ready to fight upon arrest if lawmaker won’t give in to her request to conduct talks on the Ilocos 6 conflict in Ilocos Norte. This time, she has found an unlikely defender – the Supreme Court Chief Justice Maria Lourdes Sereno. Eleven justices voted to uphold the president’s declaration over all of Mindanao. Supreme Court spokesperson Theodore Te said that the 3 others voted to limit the declaration to Marawi City, including CJ Sereno. Only one justice voted to nullify the proclamation of Martial Law. The decision validates Du30’s declaration on May 23. He placed the entire Mindanao under military rule. This follows after the clashes between government troops and Isis-supported Maute and Abu Sayyaf terrorist groups in Marawi. It dismissed many petitions that questioned the basis of the president’s declaration. The ruling stands as the first on the merits of a martial law declaration under Article 7, Section 18 of the 1987 Constitution. This safeguards the repeat of the alleged military abuses during the Marcos regime. Can these 11 justices also vote in favor of Bongbong Marcos on his electoral protest against VP Leni Robredo? Governor Imee Marcos was a former legislator. She knows that the power of legislative inquiry does not give Congress the power to deprive any citizen of constitutional rights. This includes the rights to freedom of movement. As well as the presumption of innocence. The governor explains that when Congress acts as investigator, prosecutor and judge rolled into one, it is legislative tyranny. The principle of separation of powers prevents that from happening. However, House Speaker Pantaleon Alvarez shows his being a tyrant by threatening to dissolve the Supreme Court or impeach the Chief Justice. The President once said that Alvarez has the tendency to act more superior than him. She added that the 1987 Constitution did not authorize the Congress to “act as a prosecutorial or judicial body that determines the innocence or guilt of anyone for any charge of misconduct.” There is a clear violation of human rights here. There’s no way that the President would tolerate this as a popular democratic leader. He knows that his power is from the people, unlike Alvarez. “The judicial system, not Congress, is constitutionally empowered to do so,” she said. 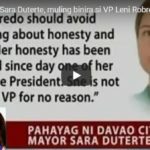 She cites Alvarez and Pimentel’s threats. 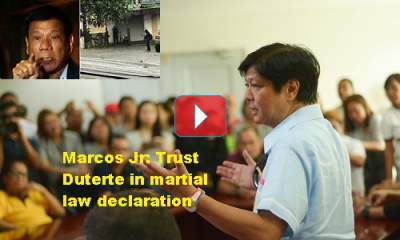 Marcos admits that she can suffer the same fate as the six Ilocos Norte employees and officials. They are held by the House Sergeant-at-Arms office since May 29 for allegedly not rightfully answering questions during the inquiry. However, they may do this only through local arrest from her own hometown. Some Congressmen is the House of Representatives are into power abuse in a major way. They probably think that they can get away with it. The people are not so keen on understanding the Constitution. This practice is rampant during the Aquino administration. That broke the spirits of good public servants like the late CJ Corona. This time, it’s the people against these abusive lawmakers who are fond of using the saying; “no one is above the law” to their advantage. They tend to forget laws exist. Marcos is here to remind them.